How long have you been meaning to clean up and organize the garage but you just never seem to get around to it? Garage and Home Transformations can help you finally check this off your "To Do" list. We have what it takes to get the job done, offering one-stop shopping for design, materials and installation. Q: My concrete is not that old but it is cracking and powdered. Why is this happening? A: If the installers of your concrete ran short on finishers, they could have tried to get by w/adding extra water to the mix and therefore it didn’t harden prior to placing & finishing; or maybe they didn’t apply curing compounds correctly. If you’ve noticed fine cracks (crazing) in the surface, that’s probably why. Sometimes they’ve added so much water the floor’s always ‘dusting’ & you can’t fix it but we can. Call us! Q: Doesn’t pressure washing help concrete? A: Yes but, after removing the grime and dirt, it should be sealed to prevent the dirt buildup again. If you should seal it, why not seal with color? Call us that’s what we do! Q: What about the cracks in our driveway, sidewalk, pool, etc? 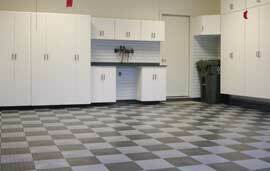 A: Garage Transformations has the method and material system for filling them. First, we v-cut them with diamond blades. After proper cleaning & preparation, we fill them with an epoxy mortar. Cracks can occur from earth settling and tree roots. We can’t gaurantee that they won’t come back, but we will always be able to fix them seamlessly. Q: Why can’t we just stamp the concrete? A: That must be done when the concrete is first placed so it’s too late. We offer a thin-stamped overlay option among many other available choices. Q: What advantages does eliteCrete offer compared to concrete? A: Our processes and products are very forgiving. EliteCrete bonds chemically & mechanically to properly prepared surfaces and has a higher tensile and flexural strengths along a higher compressive strength as well. A: Yes, eliteCrete is concrete. Concrete’s a mixture of fine aggregate (sand), coarse aggregate (stone), cement, & water. What makes eliteCrete different is replacing coarse aggregate with proprietary polymers & cross linked co-polymers. Fine aggregate is replaced with an eliteCrete proprietary blend of seven graded & shaped silica-quartz aggregate. Grey portland cement’s replaced with the higher quality white cement. While all this is more trouble to some in the industry, it allows eliteCrete much more flexibility & permanence. Q: Can eliteCrete be used inside as well as outside? Q: How does cold weather affect the eliteCrete process? Q: Aren’t eliteCrete floors slippery? A: No, special additives are mixed in to prevent slipage. Q: Can all concrete by overlaid, stained, or engraved? A: Yes, with proper preparation. Q: How should we care for our new eliteCrete floors? Q: Do you work in other environments beside residential? A – Yes! Institutional, industrial, & commercial. Q: Are eliteCrete systems floors expensive? A: The process is tile-competitive, but much less expensive than slate, stone, marble, or granite. Q: How long does this process take? A: The average project lasts 3 or 4 days, but an on-site inspection is needed to quote a timeframe. Q: Is the process messy or hazardous to our family or pets? A: No hazardous materials are used in creating our work. Q: Why choose concrete over traditional flooring? A: It’s become the new material of choice for designers and homeowners across the United States. Decorative concrete in all of its stained, colored, painted, and personalized glory is popping up in retail stores, trendy restaurants, offices, and homes everywhere. Easy to care for, longer lasting and very resilient to wear. Even if it gets marred or cracked (rarely), it can be easily healed and look new again. A: Although keeping polished concrete shiny requires minimal effort and expense, some regular care is necessary. A simple maintenance program of occasional dusting to remove grit and damp mopping with a neutral cleaner to enhance the shine. Some manufacturers sell special cleaners and conditioners for polished concrete that not only clean the surface, but also leave behind a dirt-resistant film. These products can be applied with a mop or auto scrubber and do not require buffing. Q: Will a John Louis Home Closet System fit my closet size? A: All John Louis Home Closet Systems fit closets up to 10 feet in wall length. Because the maximum configuration width is 10 feet, the closet system will fit into any wall dimension that is 120 inches (10 ft.) or less. Q: What do I do if I need more than just a Closet System? A: John Louis Home Closet Solutions are designed to meet your needs. You can start with a closet system and build on from there. Individual shelf lengths, components, hardware and accessories can be added later. If you just need a shelf or want to design your whole house, we can provide you with the solution. Q: What is the height of a John Louis Home Closet System? A: A John Louis Home Closet System does not have a fixed height. Because the system is wall mounted, whatever dimension you decide to place your top shelf determines the height. If your configuration utilizes a 24” wide shelf tower (fixed or adjustable) the tower height will be 6 feet down from the placement of your top shelf. Q: How is the closet system mounted? A: John Louis Home makes use of an Off-The-Floor wall mounting system. The system utilizes 3 universal bracket types that are secured onto the walls. The shelves are then locked into the brackets. Since the shelving covers the majority of the brackets, minimal hardware is open to view. Because the closet system is raised, the closet floor space is clear of any obstructions. Q: How can I configure my John Louis Home Closet? A: Any way you desire. If you purchased a John Louis Home Closet System, 8 standard configurations are supplied (4 - 8ft. designs, 4 - 10ft. designs) for your convenience. We will configured the closet to meet your needs. Q: Will the solid wood warp? A: To prevent warping, John Louis Home uses only quality kiln dried wood. The wood is treated and the multilayered finish process blocks moisture intake. As with any natural product, warping may occur when used in areas that contain overly excessive amounts of moisture. Q: What are storeWALL slatwall wall panels made of? A: StoreWALL slatwall wall paneling is an attractive, solid core, closed cell polymer extrusion. The engineered panel is a polyvinyl that is resistant to sunlight, is static resistant and flame resistant. It requires modern technologies to create a storage panel system that is tough enough for a factory tool room and attractive enough for a corporate board room. Q: Where in the house is storeWALL designed for its best use? A: StoreWALL slatwall wall panels are the ideal design solution for any storage, organization or display problem. StoreWALL slatwall solves problems in the office, garage, basement, laundry room, closet, pantry, etc. It is completely waterproof so it can even be used outside! Q. What accessories are available? A: We have a complete range of accessories: pegs, hooks, shelves, baskets, brochure holders and specialty components. 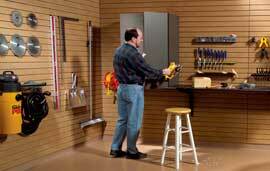 In addition, just about any existing slatwall or 1/4” peg board accessory will fit storeWALL! StoreWALL slatwall has the universal key which allows you the widest choice of accessories! Q: How tough are storeWALL slatwall wall panels? A: The storeWALL slatwall material was engineered to be strong, tough and durable. It is not affected by water, dirt, dust or harsh environments. StoreWALL slatwall is stain resistant. Wood grains and colors are solid core, an integral part of the material. This makes scratches, dings and gouges almost impossible to see. Q: How difficult is storeWALL slatwall to maintain? A: Easy! StoreWALL slatwall comes clean with a damp cloth and can be washed using any commercially available cleaner. It can be disinfected with household bleach (great for laboratory and medical applications). "Permanent" markers come off with lacquer thinner. Small scratches disappear with an acetone (nail polish remover) wipe. Stubborn blemishes or discolorations can be sanded, steel wooled or polished to match the rest of the panel. Instant and invisible repairs (if ever needed) are accomplished with “super-glue” leaving the panel as strong as before. Q: Can you install storeWALL slatwall wall panels outside? A: StoreWALL slatwall wall panels are weather proof. It is not affected by water, dirt or dust. StoreWALL slat wall panels resists the effects of sunlight and is UV resistant. StoreWALL slatwall can be used in fresh and salt water environments. StoreWALL slatwall opens a whole new world of storage and display! Q. Can storeWALL slatwall wall panels be reused? A: StoreWALL slatwall is an extremely durable, solid core material that will keep looking good for years. If you move, simply unscrew the panel from the wall and take it with you or call us and we will remove and reinstall for it you. "Brian, thank you so much for the beautiful patio! You did a wonderful job and I'm sure we'll enjoy it for years to come. I will certainly recommend you to our friends." "After watching you coat our neighbor's garage floor about 6 years ago, we were amazed at the transformation as well as the durability of the product. We're so pleased with our own garage floor now and really appreciate your attention to details— from proper preparation and application to respecting our personal property as you worked around it. Even on our initial consultation visit you impressed us with your professionalism. You were prompt, and well-prepared with samples and photos. We instantly knew we'd made the right choice for our garage project. In the future, you'll be the person we call for any floor transformations. Thanks for a beautiful end result!"